See Knitting Patterns for Spud & Chloe Yarns! We've got em! 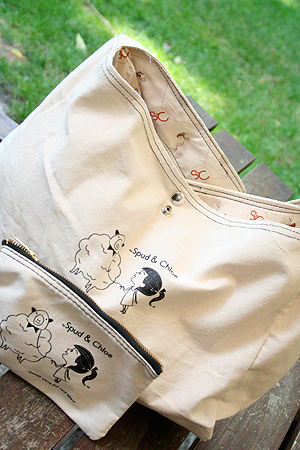 The fabulous convertible tote from Spud & Chloe, and matching pencil case. The matching pencil case is a great accessory. Fine (sock), Sweater (worsted) & Outer (Super Bulky). Spud & Chloe from Blue Sky Alpacas is a new line of luxe yarns in mod colors, all carefully selected to let you create dreamy pieces from soft baby socks to chunky sweaters, chic fashions and extra special presents. Spud & Chloe is specially made of top-quality fibers like wool, organic cotton and silk, and everything can be machine washed on gentle. So everything you make with these yarns is family-friendly and easy going - made for your REAL life. New Spud & Chloe colors & Patterns are HERE! Need some inspiration? Make sure you visit the Spud & Chloe Blog to check out the bazillions of fabulous patterns! See ALL Spud & Chloe Patterns & Knitkits!